Political Statements and Artistic Expression Featured Along St. Laurent Blvd. If one desires to know more about the MURAL Festival and what inspired its artists, Spade & Palacio Tours has them covered. For the past two years, this company has worked to showcase MURAL Festival’s urban art. Founded in 2014, Montreal-based walking food tours and bike tour company Spade & Palacio provides a number of tours which they claim on their website to be “non touristy.” This includes a tour of the Jean-Talon Market, and of course of the city’s mural and street art scene. For as long as Montreal locals can remember, the city has been a home to street artists. The various murals are a testament to that; alleyways ooze street culture. On the corner of St. Laurent Blvd. and Pins Ave. E. is one of the oldest murals Montreal has to offer, “Graffiti Granny.” Painted by a combination of artists, it is a testament of what street art is all about. It depicts an elderly woman, wearing a four-hearted necklace meant to represent Montreal, spray-painting across a wall in an alleyway. The artists made sure to use everything the brick wall had to offer, including an air-vent as a sort of boom-box. Thom Seivewright has been working with Spade & Palacio Tours for three years, and it is his first time presenting MURAL’s jewels. Beginning from Station 16 Gallery on St. Laurent Blvd., Seivewright took us on a two-hour long tour in which he made us see Montreal as an art-filled, mysterious, beautiful gem of a city. Seivewright went on to discuss MURAL Festival’s history, informing us that it was inspired by the infamous Mural scene in Miami. 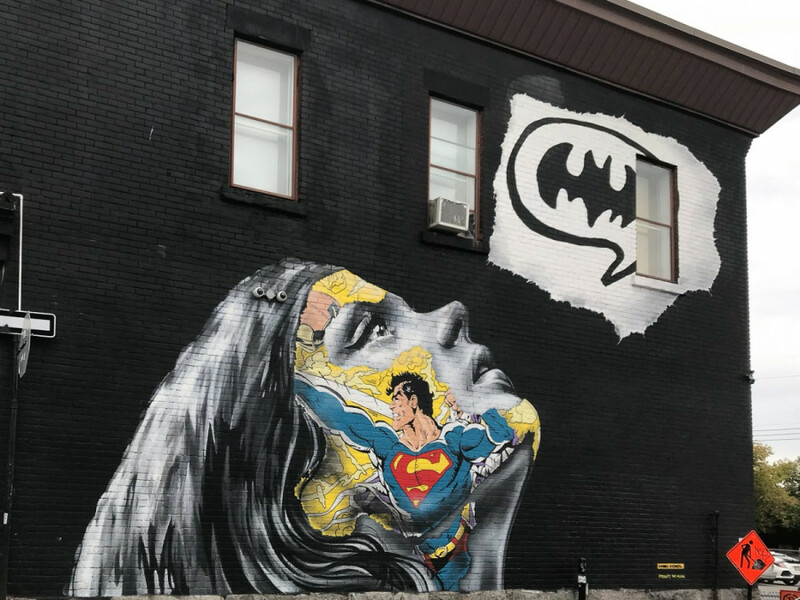 “One of the founders, André [Bathalon] went down to vacation [in Miami], and was blown away by the mural scene there, and thought that it had to be introduced to Montreal locals,” Seivewright continued. It is now annually celebrated on St. Laurent Blvd., as one of Montreal’s many summer festivals. He went on to describe how each side also adopted their own culture. Nonetheless, over the years, this sort of bisection receded as the city began to grow with the influx of immigrants. Seivewright poetically described the change of the Main from division to unification. This sort of diversity can also be seen through St. Laurent Blvd.’s murals, as they are painted both by local Montrealers and immigrants. Between the many alleyways west of St. Laurent Blvd., right next to Clark St., one finds two of MURAL’s finest facing each other. 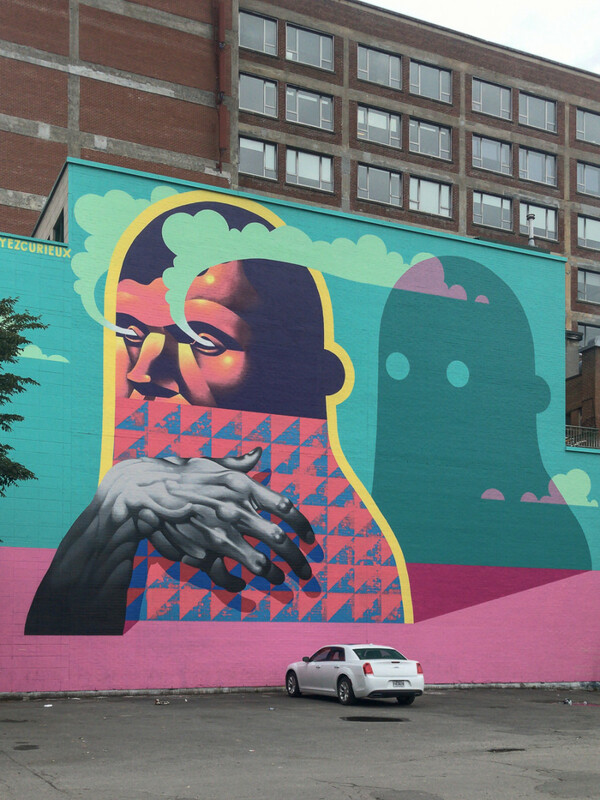 One is done by INTI, a Chilean street artist, and the other by HSIX, a Montreal local. 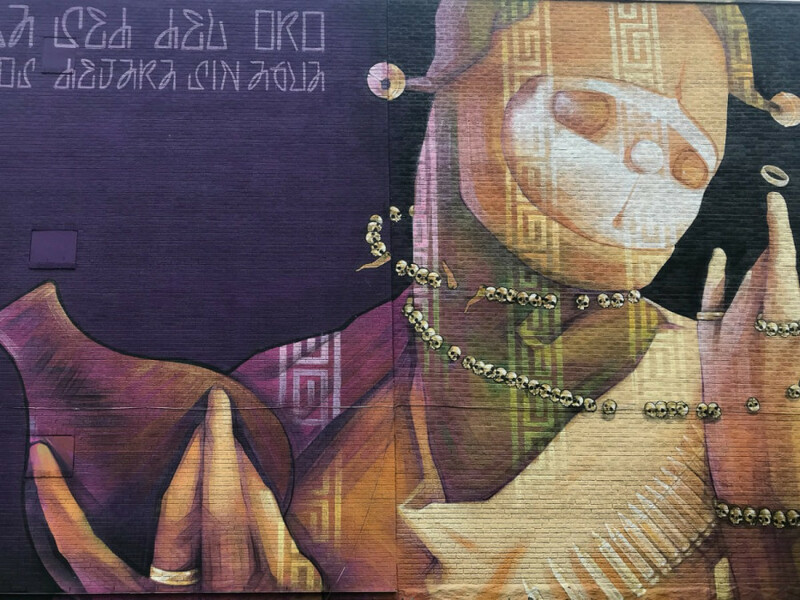 Drawn in a cartoon-like manner, the subject of INTI’s mural holds a water carafe in its right hand, and a falling bag of gold in the left. A jester’s hat adorning its head, an interesting set-up of skulls as its jewelry, the character is struggling to save the satchel filled with gold, disregarding the water falling from its other hand. A political piece, INTI alludes to the 2010 Chilean miner crisis, when 33 men were trapped for 69 days in a copper-gold mine in Northern Chile, from Aug. 5 to Oct. 13 2010. Seivewright explained that the artist accuses and criticizes the Chilean government of its monetary greed which led to the close death of its people. HSIX’s piece symbolizes another political statement regarding his own country. Montreal residents would know the scandal that lead to this mural. In 2015, following the release of Alejandro Iñárritu’s film The Revenant , Québecois actor Roy Dupuis sparked controversy by defending French-Canadian colonizers, stating that they never wronged the Indigenous populace. These murals further confirm art’s role in bringing people together, as both artists tackle socio-political issues that shook their countries. Indeed, the diversity of Montreal is especially prominent on St. Laurent Blvd. In this political climate, where discussions concerning immigrants more often than not are full of tension, art finds a way to overcome that. Spade & Palacio’s MURAL Festival tour will last until Oct. 28. So bundle up, and enjoy the tour; you won’t want to miss it.